Image by Sakaori. Some Rights Reserved. 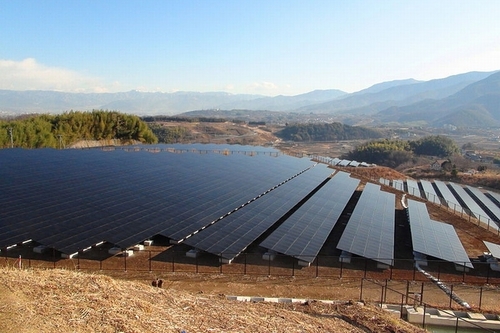 Hyogo Prefecture, Japan initiated a "Public Joint Project for Photovoltaic Power Generation" on Awaji Island in the prefecture in 2013. The prefecture issued public investment bonds (Awaji Island Bonds for Future Environment) to raise funds from the public, mainly Awaji residents, for the construction of the power generation facility and to loan the funds to the Awaji Island Kuniumi Association that generates and sells power. The bonds were all sold. The photovoltaic power generation facility site comprises about 1.54 hectares and is adjacent to the Hyogo Prefectural Awaji Island Park. The scale of power generation is about 1.0 megawatts. The sale of electric power will start in March 2014. The term of the Awaji Island Bonds is five years, and they are to be redeemed in a lump sum at maturity. The amount issued was 400 million yen (about U.S.$4 million). The bonds were purchased in 50,000 yen (about U.S.$510) units and up, and the purchase ceiling was two million yen (about U.S.$20,000) per person. The coupon rate was 0.33 percent. Japanese provinces are now facing common issues, such as decreasing birthrates and an aging population, increasing income gaps between cities and farm villages, decreasing employment, and fewer business heirs. In an attempt to become a successful model in solving these issues, "the Awaji Environmental Future Initiative" was put together by Hyogo Prefecture and three Awaji Island cities in September 2010, aiming to make the island a "Sustainable Island for Life" under three running titles--"Sustainable Energy," "Sustainable Agriculture and Foodstuffs" and "Sustainable Living"--while making the best use of the island's potential and rich local resources.